The Bastille, or formally, , was built in the fourteenth century in response to the English threat to the city of Paris during the Hundred Years War. It was a strong fortress with eight towers that protected the strategic gateway of the Porte Saint-Antoine on the eastern edge of Paris. Its design was copied in other fortresses in both France and England. By the early fifteenth century, specifically 1417, the Bastille became a prison. Over the years the purpose of the Bastille had changed so that by 1789, it was used to support the operations of the Parisian police, especially in enforcing government censorship of the printed media. Criticism grew during the 1700s as the autobiographies of former prisoners reviled their treatment. By 1889, five years after the completion of the American Revolution, more than 5,275 prisoners had ‘resided’ there. Finally, on 14 July 1789, the Bastille was successfully stormed by a revolutionary crowd that was trying to capture the gunpowder in the fortress. 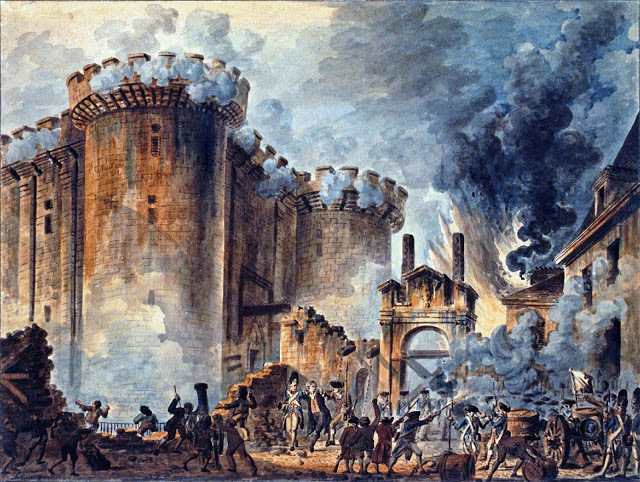 During the storming of the facility, seven remaining prisoners were released and the Bastille’s governor was killed. An eighth prisoner, the Marquis de Sade (yes, THAT Marquis de Sade), had been transferred to an alternate site only a few days prior. By November, most of the fortress had been destroyed. All that truly remained was the foundation. On 6 July 1780, Bastille Day was declared a national holiday to be celebrated every 14 July. It marked the end of the absolute monarchy and opened the doors to a sovereign nation. Since I’m not French and I’ve never celebrated Bastille Day, I was at a loss for what to say in the following part. Fortunately, About.com was able to help out. I’ve done everything possible to not copy them in their entirety. Let me give you an outline of what you would see in Paris and then I’ll give you About.com’s article address, too.